Inspiring Art Teachers to Explore Art History | Curator’s Corner: A Taste for the “Exotic”? Having blossomed into teen-hood in the 1970s, I often like to compare some of the “art” that emerged in the 19th century with the 1970s. It’s like, “what were they thinking?” Then the art historian in me calms me down and I look at some of the more peculiar pieces from that period in an historical perspective. Historical influences on art in Western Europe were immense: the British “empire,” the numerous French revolutions, the Greek Revolution, the Industrial Revolution, the Crimean War and, most importantly, the rapid expansion of world-wide trade. All of these factors combined to make the 19th century the century of “anything goes” eclecticism. Kaolin (the clay used for porcelain) was discovered in Limoges in 1772. This replaced the glass frit-infused clay of earlier porcelain, which was abandoned totally by the Sèvres Porcelain Factory in 1804. The Sèvres factory was bankrupt by 1798 because of the French Revolution (1789-1799). The appointment of Alexandre Brongniart (1770-1847) in 1800 turned the fortunes of the company around. Brongniart was a zoologist, chemist, botanist, and geologist who applied his scientific knowledge to porcelain production. New enamels were invented, new shapes (at the time primarily the Neoclassical style) were produced, and Brongniart designed a new kiln that was more efficient and cost-effective. Under Brongniart’s tenure as head of Sèvres, Renaissance, Gothic, and even the not-so-long-ago Rococo period styles were copied. In a way, this historic eclecticism was seen as preserving art movements of the past. Often, however, when copying an object or decoration from a previous period, the Sèvres piece dwarfed the original object – bingo, the trademark of 19th century historicism, sort of like the Wild West in the US: the bigger the better and more of it. Not only were porcelain objects covered in enamel decoration, but gold leaf gilding was very popular overall. This coffee pot is an exception to the over-abundance of decoration typical of the period, but it certainly conforms to the in-your-face design typical of the 19th century in European porcelain. The second half of the 19th century in Europe witnessed a series of international exhibitions displaying fine and “decorative” arts from around the world. Competition between British and French porcelain makers was particularly heated, as each country tried to establish themselves as pre-eminent in design and manufacture. This coffee pot was featured at the London 1862 International Exhibition. It was advertised as being of “oriental” inspiration, a euphemism for anything Asian. 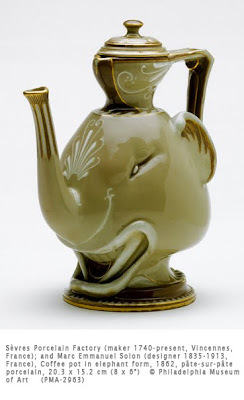 In using an elephant’s head as the motif, this pot is closely aligned to the taste for exoticism that was part of the Romanticism movement of the 1830s through the 1850s. The elephant motif was a popular symbol of magnificence and luxury. This piece features the pâte-sur-pâte (paste upon paste) technique, which involved building up low sculptural relief on the surface of an unfired pot with successive layers of slip. Such pieces gained great popularity in France and England and were expensive luxury items. Marc Emmanuel Solon later brought the technique to the Minton porcelain factory in Staffordshire, England. The Wallace Collection in London has a large collection of gorgeous Sèvres porcelain.